How to Do Files and Folders Automatic Sync with Free Software? Free and easy-to-use software helps you automatic sync files and folders between computers, network drives and USB flash drives. File sync is a great powerful function to help you keep your folders or files stay the same. File sync is similar to files backup. When you update the data on one machine, the another will update, too. If you want to work at home after working time, or you want to transfer files from PC to PC, file sync could be very useful. However, we may forget to do file sync sometimes. When that happened, it would cause a big trouble. Imaging that you planed to finish the work at home after the working time, but you forgot to sync them. What a damn thing it is! You cannot finish the job, and the consequence will not be fun. But, if you setup automatic sync before, the files could be updated automatically. Thus, you can finish your job in time. Besides, automatic sync is the easiest and most efficient way to make sure that you won’t miss the files or folders you want synchronize. Before Windows 7, it may be difficult for users to sync files. Users must setup sync by a system administrator, which could be so complex for average users. However, Windows 7, Windows 8/8.1 built in a tool called Sync Center, which make things go much easier. Because there are no server setting to worry about, and people can sync files by themselves. You can easy sync with those steps. Click Start button -> All Programs -> Accessories -> Sync Center to open it. And all you have to do next is setup what files and folders you want to sync, where and when to sync them. But, there are some shortages in Sync Center, such as when doing automatic sync, it will get error if you won’t change the password. Thus, you can use some third party software to help you. Here, we recommend you AOMEI Backupper, for its wide function and the simple interface. 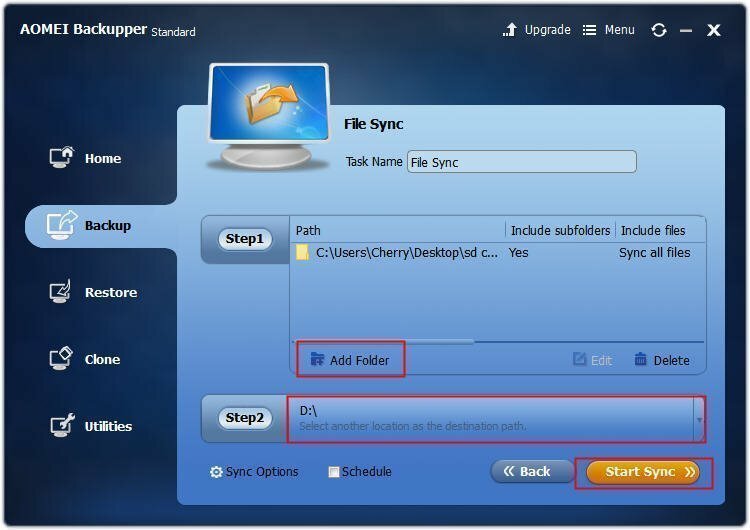 How to Do Automatic File Sync with Free AOMEI Backupper? AOMEI Backupper provides File Sync, which is a great function that you can synchronize files/folders automatically with a schedule (daily, weekly, monthly, event triggers) or real time synchronize files/folders to the target path once any change (new add, modification, or deletion) happens in the source path. The operating is easier than Windows and it can assure the data safe easily unlike Sync Center in Windows. Step1. Download AOMEI Backupper Standard, which is free. Install and launch it. Click File Sync under the Backup tab to open the file sync interface. Step2. Select the files and folders you want to sync at the step1 and choose a destination by clicking step2 at the window. Step3. To setup automatic sync, you need to do one more step. 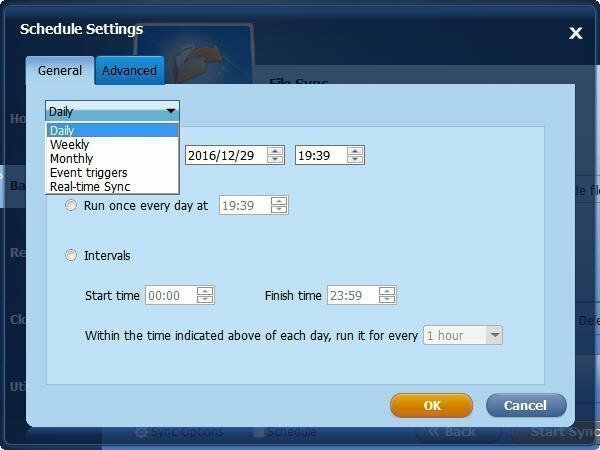 Click the Schedule, and you have entered the window where you can setup automatic sync. Here, you can setup daily, weekly, monthly or event triggers or real-time sync according to your request. When you set it up, click OK, and you will go back to the interface at step2. Click Start Sync to prompt the process. After the process reaches 100%, click Finish. Congratulations, you have done automatic sync successfully. AOMEI Backupper File Sync can only support one-way sync. In one-way sync, every time you add files and folders(or change, or delete) in one location, the same files and folders are added (or changed or deleted) in the other location. However, there are no changes made to the first location because it is one-way sync. You can write a comment for your current operation, and set up your email configuration information so that you can receive timely notifications about tasks by clicking Sync Options. AOMEI Backupper is such a powerful backup software that you can use more than automatic sync files/folders on different computers. 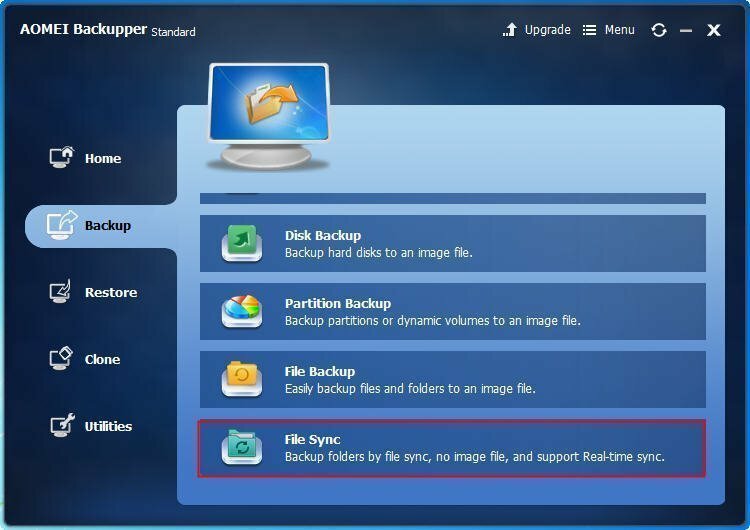 With this software, you can manage your backup imges better such as merge backup images. However, this function is only existing in AOMEI Backupper Professional edition. If you need it, you can upgrade to it directly. How to Sync Two Folders with Free AOMEI Backupper? How to Sync Folders over Network?